Republicans haven’t yet united around one plan to overhaul the tax code, though a tax reform framework is expected as soon as Sept. 25. With House Ways and Means Committee Republicans set to release some details after a two-day member retreat, consensus on the panel isn’t the only hurdle the party must overcome. For tax reform to be successful, it must also be palatable to Republican—and perhaps some Democratic—senators in a chamber that operates very differently from the House and in which the party holds a much narrower majority. If senators want to pass legislation using reconciliation instructions, Republicans will need all but two of their members to support it. A handful of senators could play a major role in shaping a final tax reform package, several tax lobbyists and others told Bloomberg BNA. The lobbyists spoke anonymously to give a more candid perspective. The Finance Committee chairman doesn’t completely agree with his House counterpart, Ways and Means Chairman Kevin Brady (R-Texas). The slim margin of the Senate’s Republican majority is front of mind in all his negotiations, he said. Hatch said at a Sept. 14 Finance hearing that his committee wouldn’t be “anyone’s rubber stamp” on a tax bill. He is among the small group tasked with crafting a consensus plan. Hatch, Brady, House Speaker Paul D. Ryan (R-Wis.), Senate Majority Leader Mitch McConnell (R-Ky.), Treasury Secretary Steven Mnuchin, and National Economic Council Director Gary Cohn have been meeting for months to craft a plan that they hope can become law this year. The group is likely to keep meeting in the coming months as the committees draft legislation. Hatch’s comments underscore the differences between House, Senate, and White House leadership—and signal the challenges to finding agreement. The forthcoming tax framework is merely “guidance,” Hatch said at the hearing. That’s likely a sign there are elements of the forthcoming framework that Hatch knows won’t fly in the Senate, a former committee staffer said. The chairman continues to push his corporate integration proposal, an idea that would remove the double layer of corporate taxation, but it hasn’t gained much traction during the past year. This year Hatch’s team proposed a partial dividends-paid corporate integration system, in which a corporation could deduct 40 percent of the dividend it pays instead of 100 percent. The proposal would help lower the effective corporate tax rate closer to the 15 percent proposed by President Donald Trump’s administration, though a tax lobbyist said it isn’t clear how it could be attached to a House bill. Hatch has also said he’s open to repealing the Affordable Care Act’s taxes in tax reform, something Brady has said would be too cumbersome. The third-ranking Republican has introduced several bills that are being discussed. Thune is widely respected and has staff with a deep knowledge of technical issues, which makes him a powerful force on the Finance Committee, a tax lobbyist said. Thune’s most popular bill (S. 1144)—which he said upon its May 17 introduction was intended to be a marker for tax reform—would allow equipment and property to be written off immediately, up to $2 million. The provision is meant to encourage businesses to invest. An August joint statement from the Ways and Means and Finance committees initially called for “unprecedented capital expensing,” though the level of expedited depreciation is uncertain because it is costly. It isn’t possible to estimate the exact cost without knowing the final level Republicans set. But full expensing—included in the 2016 tax reform blueprint—would cost $2.2 trillion over a decade, according to an estimate from the Tax Foundation. That number would drop to $883 billion over 10 years after factoring in economic growth. Thune in March reintroduced a bill (S. 711) that would relax S corporation ownership rules and charitable deduction requirements, another oft-cited piece of legislation. Thune is also involved in charitable issues, and nonprofit tax practitioners say one of his bills could end up in a final overhaul package. S. 1343, a bipartisan measure, would make donor-advised funds eligible for IRA rollovers, simplify how foundations calculate excise tax on investment income, and require nonprofits to file returns electronically. Thune previously introduced the measure—the Charities Helping Americans Regularly Throughout the Year (CHARITY) Act—in 2016. “I think the CHARITY Act has kind of emerged as the consensus,” Alexander L. Reid, a partner at Morgan Lewis and Bockius LLP, told Bloomberg BNA. The Budget Committee member and self-described deficit hawk made headlines Sept. 19 when he announced he reached a deal with Sen. Patrick J. Toomey (R-Pa.) on a budget that would include tax cuts. Congress must pass a fiscal year 2018 budget before it can move forward on a fast-track tax reform deal. The panel is said to consider a budget that would allow for $1.5 trillion in tax cuts that would add to the deficit on a static basis over the next 10 years, meaning some cuts couldn’t be permanent. Corker is among a handful of Republican fiscal hawks in the Senate who will have leverage over the final amount of the tax cuts, a tax lobbbyist said. While the resolution may allow for tax cuts up to $1.5 trillion, Corker—as well as Sens. Susan Collins (Maine), John McCain (Arizona), Lindsey Graham (South Carolina) and Lisa Murkowski (Alaska)—could ultimately say they aren’t comfortable with such a high number, a third lobbyist said. McCain notably voted against the 2001 Bush-era tax cuts, which totaled $1.35 trillion, because he said they didn’t do enough for the middle class. He also opposed tax cuts in 2003, calling them fiscally irresponsible. Because Republicans can afford to lose only two votes in the Senate, each lawmaker has some leverage, Rohit Kumar, a former top aide to McConnell, said. “Every senator has the right to pick an issue” they want to prioritize, he said. Corker has shown some clout in recent days, even though he isn’t a member of the tax-writing Finance Committee. He met with Mnuchin Sept. 14 to talk taxes and with Trump the following day. Wyden has long shown an interest in tax reform. He has previously written bipartisan tax reform plans, and is likely to keep beating the same drum during negotiations. 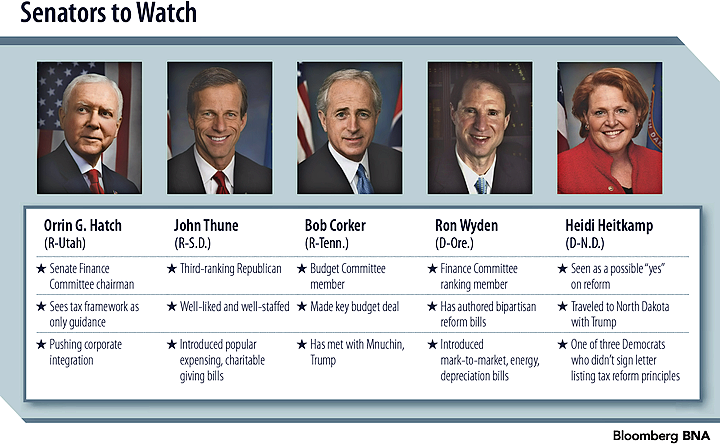 Senate staffers have previously said bipartisan bills from Wyden are among proposals they’re reviewing. The ranking member of the Finance Committee, Wyden has said any cuts need to be distributionally equal and the middle class should reap reform benefits. Middle-class tax cuts could be an area for bipartisanship, and the move is something Trump has also demanded. Wyden will likely focus on how the bill is a tax cut for the wealthy in his comments in committee and later on the floor, a tax lobbyist said. He may offer amendments in committee, but the Republican majority isn’t likely to approve them, another lobbyist said. He has also for years called for streamlining energy taxes with a technology-neutral credit. His bill (S. 1068), popular among Senate Democrats, would let taxpayers choose either an investment tax credit or a production tax credit that’s proportional to the amount of carbon emissions. Wyden in 2016 offered a string of bills meant to serve as markers if he became chairman after the fall elections. One draft proposal condensed more than 100 current depreciation schedules into six pools based on an asset’s current property class assignment. Another would make derivatives marked to market in a plan to curb tax avoidance. Despite his interest in bipartisan tax reform, however, Wyden was among 45 of 48 Democratic senators who in August signed a letter laying out conditions for a bipartisan overhaul. Among them: Democrats said they wouldn’t support a bill that gave tax breaks to the wealthy or that added to the deficit. Heitkamp was one of three Senate Democrats—Joe Manchin III (W.Va. ) and Joe Donnelly (Ind.) are the others—who didn’t sign the August letter, and the Trump administration has already singled her out as a possible “yes” on a tax reform bill. The White House is aiming to get Heitkamp, Manchin, and Donnelly in their pocket early, to give them more breathing room in a whip count, another tax lobbyist said. Still, another said, they shouldn’t expect to get support from any other Democrats, since the rest have explicitly said they won’t support the president’s plan no matter what it ends up looking like. Trump famously called Heitkamp a “good woman” in a joint appearance in North Dakota earlier this month, a signal of potential for bipartisanship. Heitkamp flew with Trump on Air Force One to the event, which was held in Mandan, her hometown of 21,769 people. Her office has announced she will hold “listening sessions” Sept. 22 in North Dakota. Democrats in the Senate will also have opportunities to offer amendments on the tax bill once it comes to the floor, because of the rules of the reconciliation process. Heitkamp, Donnelly, and Manchin could hold a lot of sway in that process if leadership thinks including their amendments would help secure their votes, a lobbyist said.